I’m getting closer and closer with each and every run! I scaled back a bit this week as I have my 4 hardest and most important weeks coming up. Last week I ran 4 half-mile repeats on the treadmill so this week I went for 5 outside. It was much harder running them outside as I was pushing myself to faster times. Next week I have 6 repeats scheduled. I think I will go back to the treadmill. Eee! My long run was a 14-miler, which I ended up running on Thanksgiving morning with my dad on the bike. It was fun to get out for our own little turkey trot and then head to their house for a big, delicious Thanksgiving meal, beach walk, dessert, and Thanksgiving meal #2. Georgie ran a mile with me twice. 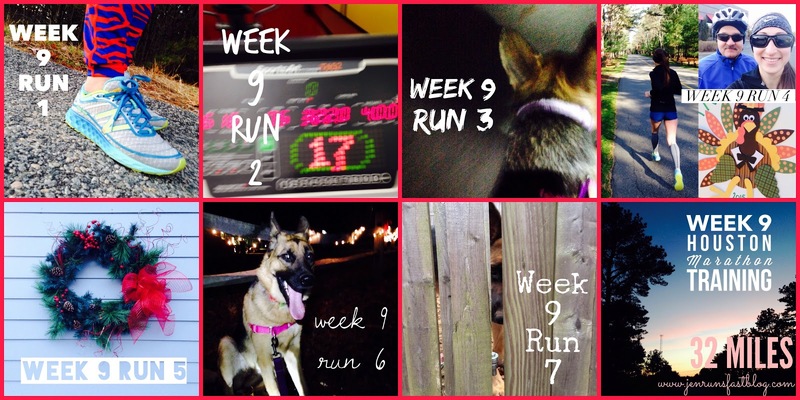 Both runs were in the dark, both with a few sniffing stops and bathroom breaks. My neighborhood is so dark and even with my headlamp, flashlight and her flashing collar I don’t feel seen so I ordered her a pink reflective jacket on Black Friday! Can’t wait for that to come in. She’s going to love it. · The 4th Annual Jingle Jog is this Saturday morning! Looking forward to digging out my Christmas compression socks for a fun 5k in Falmouth! · 7 weeks until the Houston Marathon!